It was formerly very active in Peninsular Malaysia, but because of hunting, its habitat destruction and its capture for trade, it had to migrate to Java Island, hence the name, Java peacock. It is a popular bird elegant and colorful plumage. Among the green peacocks, the Java seems to be the most beautiful, the most colorful and brighter. It has a glossy wings cover with an always bright golden green chest. This is a very elegant bird, large and long with a tapered blow and with an inclined posture. Ocelli that draw eyes also cover its tail feathers. The animal is mainly characterized by its sustained flight when traveling to roost. The male and female java peacock are very similar. They have some of the same colors, but the female is less bright. Both sexes each have a crest composed of a long, narrow tuft of feathers about 16 cm as pendants erected along the entire length. Their paws and tails are long and their wings are heavy. This is also the long queues shaped silhouette that make them more beautiful . Unlike the female, the male has a sort of cry repeated call as “Ki-Wao” while for the female cry like “aow-aa”. 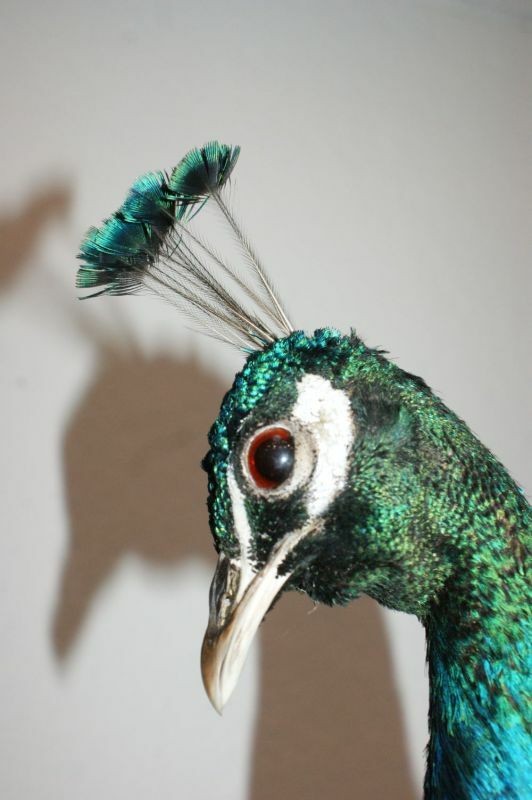 Sometimes the voice of some green Peacock depends on their morphology, but compared to the Blue Peacocks, greens have low vocal ability. About the size and weight of the animal, the male is longer and heavier because it can measure up to 3 meters and can reach a weight of 5 kg, while the female measure at most 1.10 m and weighs only 1.1 kg. 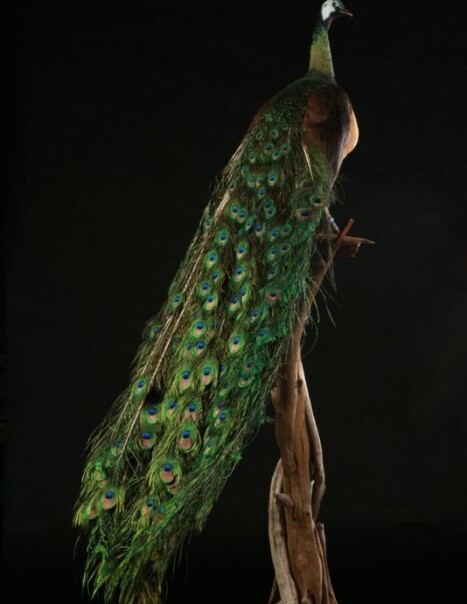 Thanks to its beauty, the Peacock became an object of art. 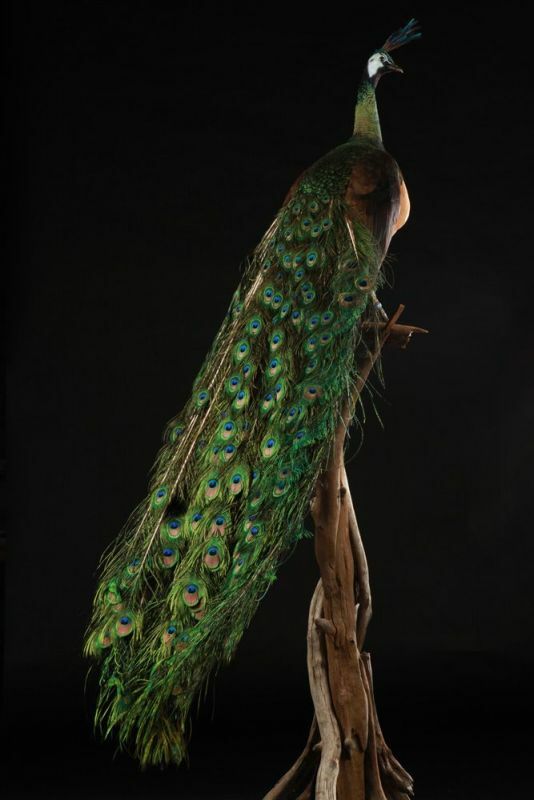 Another sub species of peafowl, the white peacock (pavo cristatus) is a taxidermy item that a lot of designers look for art collection, cabinet of curiosities and home decoration.